Al Fresco Dining: With a wide range of outdoor dining furniture sets, you can either replicate the your indoor dining room or create a whole new look for your patio. If you have an expansive outdoor space, consider a traditional-looking rectangular outdoor dining table. If you have a small patio, versatile drop-leaf tables or high cafe-style options may be better choices. 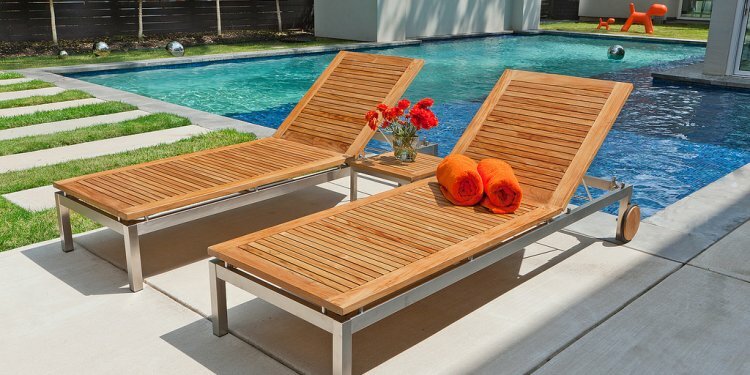 Choose a table in warm, FSC-certified teak for the ultimate outdoorsy look or a durable aluminum metal table with a powdercoat finish to keep it looking crisp. Vibrant, weather-resistant cushions keep outdoor dining benches, chairs and bar stools in top shape, as well as provide added comfort for guests. Stock your tabletop with acrylic glassware and melamine dinnerware—durable and casual, it can stand up to outdoor dining. Keep serveware similarly durable with outdoor-friendly wood platters and platters of galvanized sheet metal. Lanterns arranged on the floor of the deck, string lights wrapped around the deck railing, and tealights and citronella candles on the table give a nighttime dinner a sweet ambient glow. Patio Lounging: Outdoor sofas, chaise lounges and poufs make your backyard the place to be. Lightweight aluminum frames look sleek, and synthetic mesh is both comfortable and fade- and mildew-resistant. For expansive patios, try a full outdoor sectional sofa, perfect for seating the whole family and entertaining guests with summer barbecues and celebrations. Add chaise lounge chairs to your outdoor sectional for even more laid-back lounge space. If you have an apartment balcony or limited yard space, furnish with a range of versatile polyester mesh chairs. Complete your patio furniture set with an outdoor coffee table and a couple of ottomans in colorfast, UV-resistant and recyclable resin wicker. Accent with colorful pillows, coordinating umbrellas and comfortable outdoor area rugs.